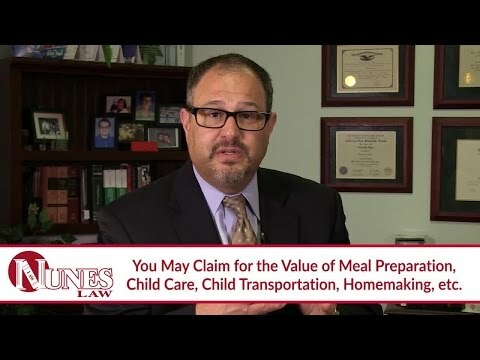 Listen as Frank Nunes explains what claims you can make for damages if you are a stay-at-home parent or your work is done in the home. If you do not have income that has been lost as a result of an injury, you cannot claim such income. However, your work in the home does have value, and you can make claims for several categories of the work you are not able to perform as a result of an injury. If you prepare meals, take care of children, take children to and from school or after-school events, or perform various homemaking activities, you may be able to claim damages for your inability to do so. This may especially be true if you have to hire someone to do this work for you. Your time is not without value just because you do not have a job outside of the home that provides income. Watch the video to learn more. If you have additional questions about what damages you can claim following an injury, I want you to call me at 559-436-0850. I welcome your call. Visit our firm’s educational website at https://www.nuneslaw.com, where you can view more videos and media content from our law firm.